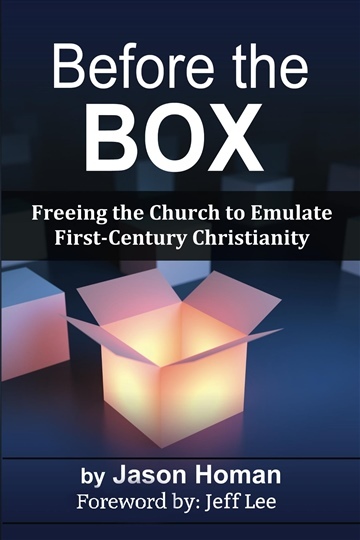 In "Before the Box" we take a journey through the church describing the "boxes" (traditions, expectations, and extremes) in which modern Christianity has encased itself. To move forward in our spiritual lives and to make or churches most effective for Jesus we must get back to a time before these traditions, expectations, and extremes; a time "Before the Box". Hi folks! I'm Jason Homan. I was born among the corn fields of Michigan and raised in the bustling suburbs of Toronto. Early in life I made the choice to be a follower of Jesus Christ. That was the most important decision of my life. Since then things have not always been easy -- life has pain, challenges, and disappointments, but I have been grateful for God's help and guidance as I have walked through this life. I attended FaithWay Baptist College of Canada and earned my undergraduate degree in theology. Shortly after that I married a fantastic, pretty and talented girl named Debbie. After working with some of the most dynamic ministries in Canada we settled on Cape Breton Island where I have pastored the good people of Northside Baptist Church for nearly fifteen years now. Hobbies... That one is tough. When not travelling, speaking, or writing, you will likely find me working on my old truck or strumming away on my guitar. A few years ago it seemed that God wanted me to use all of the avenues of communication that were available to me to convey the message of the love of Jesus, and make the lives of others just a little brighter. So, this is a part of that calling.